Note* Douglas B BLACK Son of Mr & Mrs T M Black of Pakenham Upper. Born July 20th 1898 at Mooroolbark. Attended Pakenham Upper State School, which he left after obtaining his merit certificate. He was engaged in orchard work before enlisting. 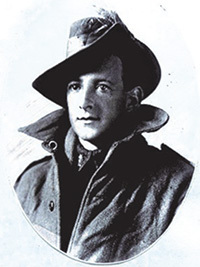 On June 25th 1918, he went into camp at Broadmeadows & was chosen for the Light Horse 7th General Service Reinforcements, Egypt. Sailed from Sydney in Oct 1918, on the Malta. [S50] Miscellaneous Source, Pakenham Upper School Roll of Honour. [S2] Registry of Births Deaths and Marriages Federation Index Victoria 1889-1901 "registered at Lilydale." [S2] Registry of Births Deaths and Marriages Federation Index Victoria 1889-1901 "mother indexed as Marg H ROGERS." [S357] Narre Warren and District Family History Group, Sacrifice and Patriotism.